Bright Funds – The Vanguard of Charitable Giving? “I’m running 100 miles for [fill in cause]. Please donate to my campaign” We’ve all received these pleas from friends, family and co-workers, and donated out of some combination of guilt, genuine interest in the cause, or desire to support said friend. Bright Funds is trying to transform charitable giving by making it an everyday part of consumers’ financial plans, rather than a reactive response to someone’s plea for dollars. Founders Rutul Dave and Ty Walrod met at Coverity, and felt that the problem with non-profits was that it was hard to figure out which ones are good, who to trust. They set out to create the “Vanguard” of charitable giving. They aim to create a brand that consumers can trust to streamline their charitable giving. Bright Funds takes a 7.5% cut of all funds raised through their platforms. For non-profits, this is merely another potential channel for funds, and is cost-competitive with other online donation platform charges. Bright Funds features funds that gather individual non-profits into cause-specific portfolios. 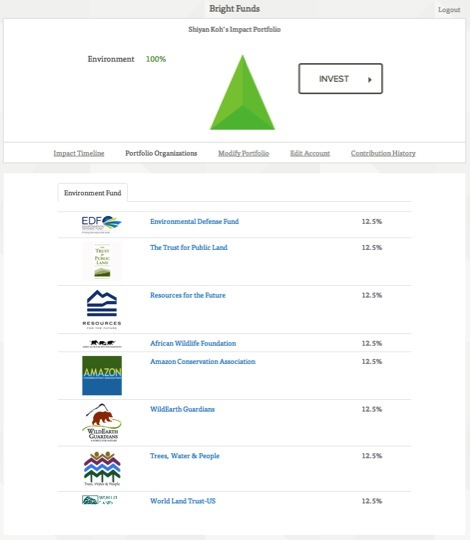 For example, consumers who want to “invest” in the Environment are presented with a shortlist of 8 environmentally focused non-profits. 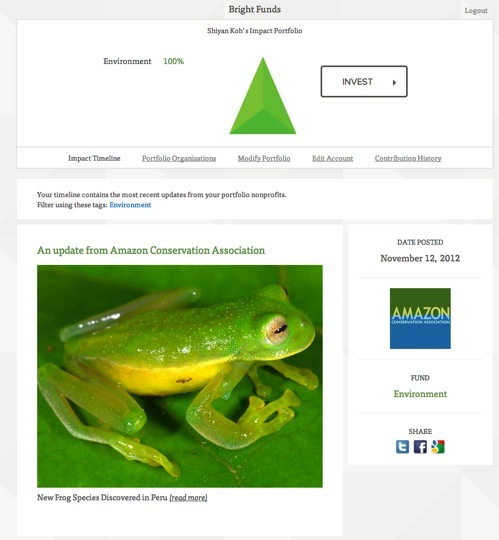 The user can adjust the percentage of the “portfolio” that they wish to allocate to each organization, read more about each organization, and receive updates about the work organizations are doing through a feed. Finally, Bright Funds consolidates and tracks all of the charitable giving done through their platform, for ease of tax reporting. We love this feature! The company will be launching their consumer-facing product on Nov 27, with an enterprise product that integrates with HR offerings to be released next year. The enterprise product will allow employers and their employees to manage corporate donation matching programs. Were these the top 8 from an objective ranking criteria? How much qualitative assessment was there? What was the process by which that assessment occurred? Was it all reliant on third-party data, or did Bright Funds conduct primary research directly with the organizations listed? The aggregation of existing rating data from Charity Navigator, GiveWell, Philanthropedia, and Charity Watch is a good first step, but doesn’t seem sufficient to overcome the initial trust burden. It would be helpful to see the underlying ratings from the data sources that Bright Funds is drawing from, so that consumers can make more informed decisions about how to allocate their dollars. We believe there is a lot of room for innovation in the charitable giving space, and would love to see Bright Funds integrate more sources of data together for each organization. Which organizations are close by, and working on causes I care about? Which organizations have my friends endorsed/worked with? Can I see all of that information overlaid with the Charity Navigator, GiveWell, and Philanthropedia data? 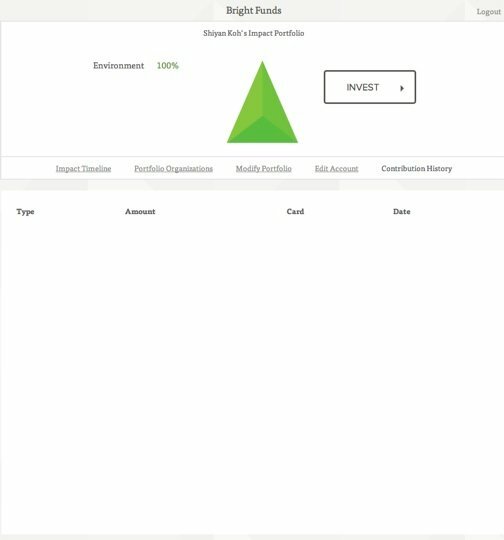 Check out Bright Funds on November 27, and let us know what you think in the comments!